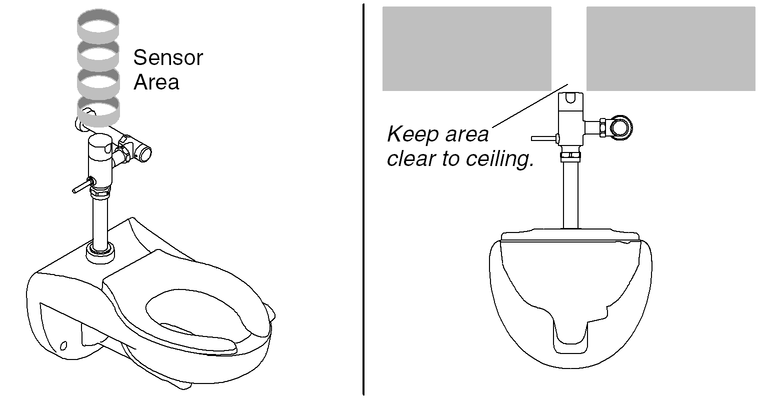 The area above the WAVE sensor must remain clear of obstructions all the way to the ceiling. Installing any item (grab bars, shelves, cabinets, etc.) in the sensor area may interfere with proper operation and cause sporadic flushing. If leaking occurs after a flush, replace the vacuum breaker assembly with part 1192024. If leaking continues after replacing the vacuum breaker assembly, replace with Sloan valve VB6551A.